A protest is to be held at the Civic Centre at plans to build on Craigavon City Park. As the group Save Craigavon City Park and Lakes prepare to head to London after winning the Best Park in NI, the group say they are more determined than ever to stop future development. The protest is due to take place outside the Civic Centre on Monday 27th November at 6.30 to coincide with the Full Council Meeting. Kelly Laverty of the Save Craigavon City Park and Lakes Community Group has written to Armagh Banbridge and Craigavon Council chief executive Roger Wilson requesting that the council recognise the ‘Best Park’ title awarded by the Fields in Trust. 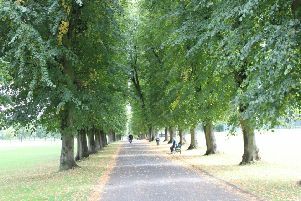 She said: “The City Park will soon compete on a national stage for the title of “Best Park in UK”. This is a landmark achievement for Craigavon and, on top of winning the title of “the Most Desirable Place to Live”, is most deserving of recognition as it can only enhance the status/potential/reputation of Craigavon. “We, as residents, are extremely proud of this award, just as we are proud that nine parks in the Borough were awarded Green Flag Status in 2017. “We would ask that Council formally recognise the success of Craigavon City Park by: advertising this award on their website and social media platforms; erecting a banner on the hoarding at the entrance of City Park promoting our place in the final of the Competition as Best Park NI 2017; ensuring Council are represented at the Fields In Trust Awards Ceremony in London on 29th November; entering Craigavon City Park into the Green Flag Accreditation scheme for 2018 along with other parks in the Borough; halting the proposed Redevelopment of Craigavon City Park and awarding the same protected status afforded to Lurgan Park and the Peoples Park.